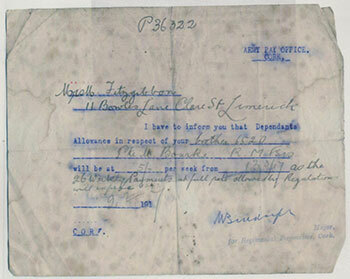 The First World War correspondence of Michael Bourke, Garvey’s Lane, Limerick. During the First World War, letters allowed soldiers in training or at the front to keep in touch with home. 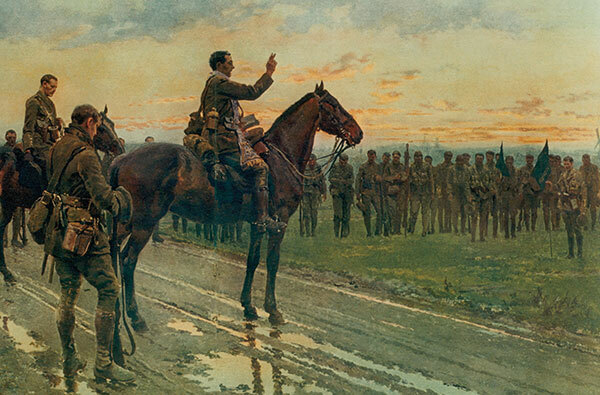 Michael Bourke of Garvey’s Lane, Limerick, wrote at least 36 letters to his sister Mary over the nine months from 2 October 1915 to 28 July 1916, providing vivid insights into the thoughts of the enlisted soldier. Joining up in late August 1915, Burke, now with the army number 6520, was sent to the 5th Battalion Royal Munster Fusiliers (RMF), which had at the outbreak of the First World War become a special reserve battalion to which men enlisted locally were sent for training before going to the front. Conscious of the welfare of those at home, Burke arranged to pay half of his shilling per day pay to his sister, Mary Fitzgibbon of Bowle’s Lane in Limerick’s Irishtown, in addition to the dependant’s separation allowance. Such allowances were essential to survival, with wartime increases in food and fuel prices. Mary Fitzgibbon was in a particularly vulnerable position over several years; the 1911 census shows that her husband was in the Limerick Lunatic Asylum and, with five children to feed, any extra money that she received was certainly welcome. The impact of censorship on Michael Bourke’s letters was evident: ‘You know that we cannot say what we like in a letter, do mind what you say … as they are read’. This was the case for all letters home; one RMF sergeant in August 1916 explained that ‘We are not allowed to tell where we are, nor any of what we are doing, as the Kaiser’s agents are everywhere looking for information’, while a soldier of the American Expeditionary Force in France similarly remarked, ‘I’m sorry I can’t say much’. Letters were also censored because there was a fear that any leaking of the number of soldiers’ deaths would undermine morale at home. Despite this censorship, however, the strength of emotional attachment to family sounds clearly through the letters from soldiers far from home and in the middle of the dangers of war. Bourke’s sister and her family were very important to him, apparently more than were his other siblings. This affection permeates his letters, the strong bond between them showing in the greeting ‘My Dear Sister’ and in his requests to her to write back as soon as possible. This was not unique: as Basil Clarke in War Illustrated explained, ‘Letters from home were as essential in their way to a soldier in the field as food and supplies; for just as food is needed to keep him in fighting trim, so is news of relatives and friends to keep him in good spirits and fighting mood’. Bourke’s craving for mail meant that he became terribly disgruntled if the flow was interrupted. He looked to his sister, his elder by three years, for advice and for news about the neighbours. Any failure to reply to his requests ‘to write soon’ caused annoyance and frustration: ‘Well, I am most thankful for what you have done, you told me that you would write on Wednesday, but I have got none’, or ‘I wrote to you a few days before I was coming into the trenches, but got no answer yet, so if you cannot answer this it will spare me a lot of time as I am sick of writing and getting no reply. So, you need not expect me to write anymore if I don’t get an answer to this’. The British army was responsible for dispatching 8,150,000 letters in 1917 alone, but Bourke’s longing for correspondence from home pushed logic aside. Above: A letter informing Mary Fitzgibbon that she was in receipt of a dependant’s allowance of five shillings per week in respect of her brother, Michael Bourke. Such allowances were essential to survival, with wartime increases in food and fuel prices. A 31-year-old single man, Bourke was close to his three nephews and two nieces, especially his apparently day-dreaming niece, ‘my chum, wistful Winnie’. This affection translated into generosity in her case as well as her mother’s, and when she was badly off for boots he promised to get them for her if he could. 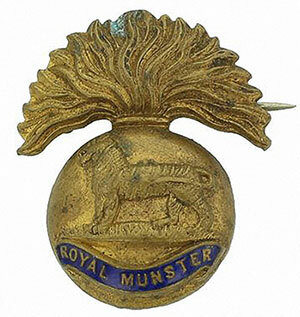 On another occasion he promised her a Munsters sweetheart brooch, incorporating a miniature badge of his regiment—just like the brooches made for other regiments, including the Royal Dublin Fusiliers, South Irish Horse and Royal Engineers. Later, when the brooch could not be acquired, he promised Winnie ‘a nice silver chain and cross, which will be nicer’. Something of a mischief-maker, he sent Christmas boxes to both his nieces, May and Winnie, saying, ‘I hope that they hadn’t a row over them as I am sure that May was mad as Winnie got hers a day before her and I would enjoy the row if only I could see it’. Above: A Munsters ‘sweetheart brooch’—when such a brooch could not be acquired, Michael Bourke promised his niece, ‘wistful Winnie’, ‘a nice silver chain and cross, which will be nicer’. This same letter also shows how army enlistment could provide an opening for a man’s hidden abilities. Michael Bourke’s leadership qualities quickly led to his promotion to lance-corporal, with the prospect of increased pay and further promotion. Here Bourke betrayed his enthusiasm for the army, which for him meant both the camaraderie of men who looked out for each other and the discovery of his own personal ability. He relates that ‘after three months’ service, I can instruct men … the government would not spend 75 pounds for my course only they know I can master it … I always knew that there was a better side to me than the one I showed at home’. He was extremely proud that he had in one day instructed two classes of 72 and 60 men respectively, with the possibility of more such opportunities on other days. Furthermore, the level of recruitment from Limerick—along with his new-found self-confidence—comes across in his comment that the army had gotten ‘so many men from Limerick, why not get one to instruct them, so I made myself that one and will stick to it’, with an eye to getting his certificate as a gymnastic instructor and an additional shilling on his daily pay. The use of humour as a way of surviving hard experiences also comes across in Bourke’s letters, as does the way in which army camaraderie both accommodated and highlighted local and national differences. While training as the only Irish gymnastic instructor in the camp—they called him ‘Irish Mike’—he was brought up on stage, where the instructor ‘opened a press and out walked the skeleton. Well I looked and said “Alas poor York [sic] I knew thee well” and the class laughed. “Well”, says he to me, “You’re from Ireland”, so of course I said I was and that settled it.’ On another occasion, counteracting fear with humour is evident in his account of talking to a fellow soldier who intimated that ‘he didn’t care if he was killed’. Bourke enquired as to the fate of his children in this situation and referred to them as his ‘snotty little orphans—and we didn’t half laugh’. In a letter to his sister on 10 June 1916, just before he departed for France, he joked that ‘I am not downhearted … because, as I say, anyone that’s born to be hung will never be shot’. 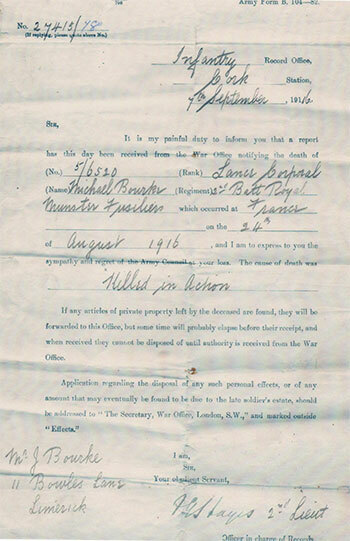 Above: The letter informing his kin that Lance-Corporal Michael Bourke had been killed in action in France on 24 August 1916. His body was never found. In May 1916, as word of the Dublin rebellion spread among the Irish units at the front and as the Limerick Chronicle carried reports of the arrest of 28 Limerick Volunteers, Michael Bourke enquired of his sister whether a man he knew, Michael McInerney, an assistant fishery manager from Lock Quay in the Irishtown district and a Sinn Féiner, was one of those arrested. While Bourke had apparently got the wrong McInerney (the arrested man was James McInerney), the enquiry does throw light on the range of Bourke’s acquaintances, or at least of people he knew; Lock Quay was quite near his home place and was inhabited by a social mixture ranging from managers, shopkeepers and clerks to unskilled labourers. Religion was very important in soldiers’ lives—there are no atheists in foxholes, as the saying goes—and visitations from the army chaplain helped to fortify them spiritually before going into battle. Bourke’s native city with its eleven churches meant that he was familiar with different religious devotions, and he asked his three nephews to observe the ‘Nine Fridays’ in honour of the Sacred Heart for him. This devout attitude also shows in his many requests for prayer books and rosary beads, and for his sister to direct her children ‘to pray to St Michael every night for me and tell them he will bring me back again with the help of God and the Blessed Virgin’. It is estimated that enlisted men fighting at the front had a life expectancy of around a fortnight—something borne out by the fact that 110 men had been killed in action within two weeks of the 2nd Battalion RMF’s arrival in France on 13 August 1914. Assuaging his sister’s fear of this happening to him, he wrote: ‘You people at home think that when a person comes here they are killed at once. But believe me it’s all wrong as before very long we all expect to be at home, so don’t worry.’ This hope of coming out of the conflict unscathed kept him going, as did his intention to buy a ‘good horse and car’ so he could join the ranks of Limerick’s 362 carmen, who were kept busy transporting goods from the docks and the railway. 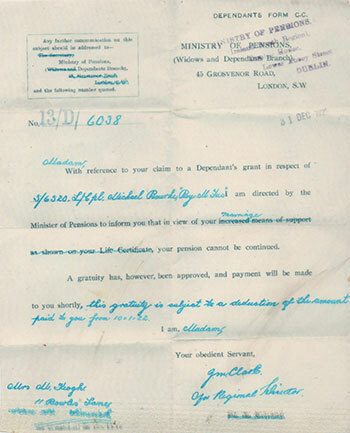 Above: The 31 December 1921 letter from the Ministry of Pensions to Michael Bourke’s sister Mary, informing her that her dependant’s pension would be discontinued because of her marriage to Patrick Keogh. The best-laid plans of mice and men are soon undone, however. Orders were received by the 2nd Battalion RMF to launch an attack on 24 May 2016 on part of the old trench remaining in the enemy’s hands at Martinpuich, in the Pas de Calais district close to the Somme battlefield. During this unsuccessful attack, Michael Bourke was one of 26 men of all ranks killed. He had been in France for eleven weeks. And he is still there: he has no known grave, being commemorated on the panel dedicated to the RMF on the Thiepval Memorial to the 72,244 men whose bodies were never found. Bourke’s family were notified of his death; his sister Mary, like many others, continued to receive a dependant’s separation allowance until the end of February 1917, and then a dependant’s pension of five shillings a week, a significant reduction of her previous allowance. In 1920 she received three pounds from Michael’s estate, to be distributed equally between her and his other siblings. In 1921 Mary, now a widow, married labourer Patrick Keogh, a widower and former soldier. Her dependant’s pension was withdrawn, removing the last tangible contact with her brother Michael—apart from the letters that have been treasured by his family over the intervening century. Tadhg Moloney is the author of The impact of World War One on Limerick (Cambridge Scholars’ Publishing, 2013). S. McCance, History of the Royal Munster Fusiliers: from 1861 to 1922, Vol. II (Aldershot, 1927). M. Roper, ‘Nostalgia as an emotional experience in the Great War’, The Historical Journal 54 (2) (2011), 421–51. J.M. Winter, The experience of World War I (New York, 1989).